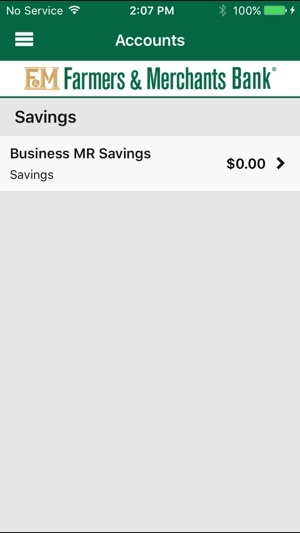 Mobile Banking from your iPhone or iPad! 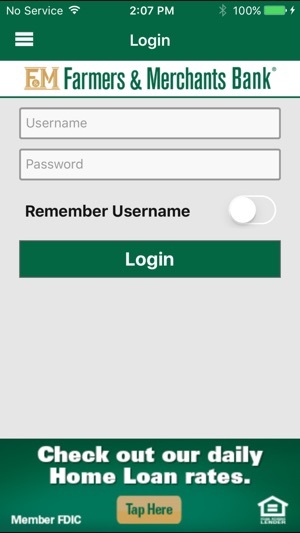 Farmers & Merchants Bank’s (F&M) Mobile Banking offers you 24/7 access to view your account balances, search recent account activity, transfer funds between eligible accounts, and even find the nearest ATM or branch location not to mention, paying your bills. – all from your iPhone or iPad! •	Accounts: View account balance, view or search recent transactions. •	Transfers: Transfer funds between tow eligible accounts. 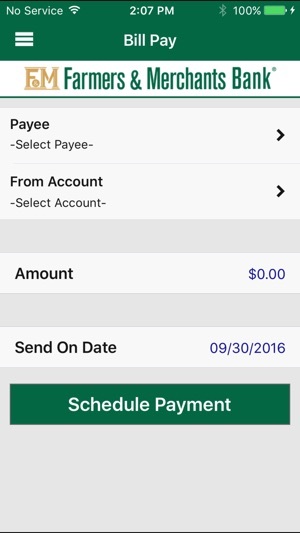 •	Bill Pay: Pay your bills right from your phone. •	Locations: Search for locations by zip code or address. •	Security: Know your account information is safe at all times. Security: The security of our customers is our #1 concern. 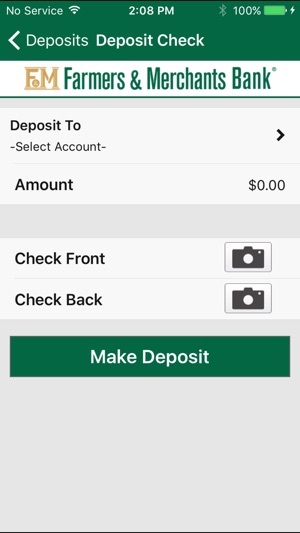 F&M’s Mobile Banking app utilizes best practice security services from Online Banking such as HTTPS, 128-bit SSL encryption, PIN or password access, and application time-out when your phone is not in use. 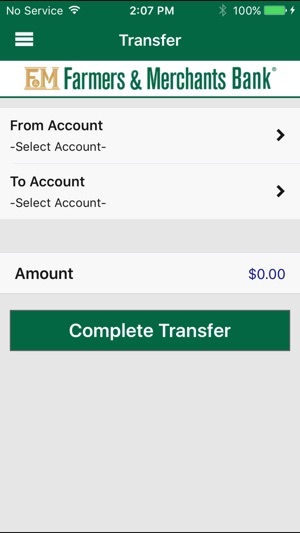 F&M’s Mobile Banking is available to all F&M consumer customers who have registered for Online Banking and are enrolled in Mobile Banking. Visit m.fmb.com to enroll in F&M’s Mobile Banking. For more information please visit us online at www.fmb.com/mobile, call us at (866) 437-0011 or send an email to internet.support@fmb.com. F&M’s Mobile Banking specialists are available Monday through Friday from 7:00 a.m. to 9:00 p.m. and Saturday 8:00 a.m. to 5:00 p.m. Pacific Time. Farmers & Merchants Bank is a Member FDIC and an Equal Housing Lender. iPhone and iPad are trademarks of Apple In., registered in the U.S. and other countries. App Store TM is a service mark of Apple Inc. Farmers & Merchants is the strongest bank, with great customer service. The app works, and is obviously way more convenient than driving to the ATM or calling. However, the technical side of things is a bit murky and challenging: it requires separate passwords for mobile and desktop, locks out easily and is hard to unlock, and is quite glitchy or otherwise user unfriendly. Meh! No stars would be better! It would be nice if this Bank started to get it together. During the past year C/S has really gone down. I used to really like this bank, but this is the last straw. Everything else is working on my laptop , iPad , & iPhone except this app. I can't even delete the app! It's all Grey and doesn't respond to anything. I don't have time for this or all their stupid charges when they are the ones making the errors. Much easier to switch Banks. Don't bother with this one! This is new and improved? Banner ads and a challege question everytime you log in. Come on, really? Why not implement touch-ID? You roll out a new app and take a step backwards in the process. Can only deposit to checking account now, not savings? Get rid of the challenge question, implement touch ID. Stop the large rotating banner ads for CDs and other bank products. At least make the ads smaller and not swap. I feel like I'm at some clickbait website, not my financial institution. Is this optimized for 6 plus phones? I feel like this app was designed for my grandmother.